Paskal Milo (l) and Petrit Vasili. Today LSI leader Petrit Vasili and PDS leader Paskal Milo signed a long-term collaboration agreement between their respective parties. It is still not known precisely what is contained in the agreement between the two parties, which in any case, based on the McAllister+ agreement between Prime Minister Edi Rama and opposition leader Lulzim Basha, will have to enter the elections separately. The agreement will materialize during the election campaign and with respect to the future government of the country. […] LSI shows that it is an open party that seeks collaboration, values allies, and doesn’t throw them in the trash. The agreement between the parties, both which were in a coalition with the PS during the 2013 elections, comes one day after PS deputy Petro Koçi ask the smaller left-wing parties to deregister from the elections and ask their electorates to vote for the PS in order to maximalize its votes. 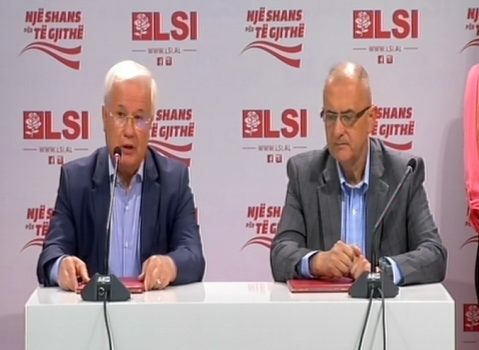 PSD leader Skënder Gjinushi already refused to withdraw his party and support the PS. It seems that the agreement is also the result of discontent among the small left-wing parties about the Socialist Party, which in 2013 didn’t failed to respect its pre-electoral agreements.